On April 11, Windward's Think Differently: Fundamentals of Entrepreneurship class headed to Silicon Beach to learn about Amplify, a venture capital firm and startup accelerator. 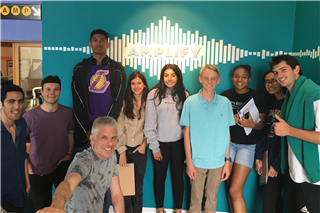 Students first heard from Windward parent Paul Bricault, Amplify's Co-Founder and Managing Director, to learn about Amplify's process in determining which startups to invest in and how Amplify supports the growth of those companies. Paul shared advice for budding entrepreneurs interested in starting a company, as well as how best to approach an accelerator firm and pitch their business. Following this conversation, students met with two Amplify-backed startups to learn about their process and rationale for creating their companies, and how they have grown since partnering with Amplify. Students enjoyed listening to these startup's pitches, in addition to asking questions regarding their business and growth strategy. In Think Differently, students have been working on ideas for their own startups, honing their presentation and pitch skills over the course of the year. This trip helped them better understand the process of taking their startup from an idea to a profitable company, and allowed them to connect with community members and industry contacts who they could turn to for advice and support. This was the final field trip of the year for the entrepreneurship class, but proved to be a productive and inspiring experience. Thank you to Paul and the Amplify team for welcoming us!